NASA unveiled the discovery on Tuesday (March 12) with a bold announcement that Mars could have supported primitive life at some point billions of years ago. The Martian find was made with the help of NASA's Mars rover Curiosity, the largest rover ever to explore the Red Planet. But in order to create a clear picture of the story of habitability and life on Mars, scientists will need to get their hands on fresh samples of the planet collected by an ambitious future mission. "On the one hand, it shows what we can do with instruments on the surface of Mars," Bruce Betts, the director of projects at the Planetary Society, told SPACE.com. "We'll always be able to do more with our labs on Earth than what we can do on Mars." The Curiosity rover was able to bore into a Martian rock and find evidence of a habitable environment, but more comprehensive work can be done in labs on Earth, Betts said. For this reason, scientists like Betts have campaigned to have sample return added as non-negotiable for the next mission to the Red Planet. "You want rocks that are carefully collected," Betts said. It's important to know exactly where the rocks are coming from, Betts said. If scientists know the context in which the rocks were found, it will help them analyze them in a broader context. 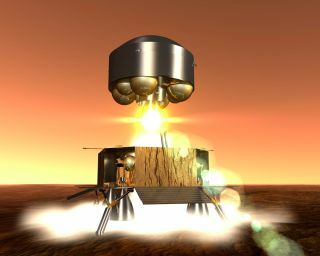 Although there are no solid plans to build sample return into a mission currently in development, future NASA missions are using other means to investigate the Martian interior and exterior. The MAVEN mission — a Mars orbiter launching later this year — will investigate the ionosphere of the Red Planet to see how carbon dioxide, oxygen and other compounds could have dissipated over time, leaving Mars with the cold, arid atmosphere scientists see today. NASA's InSight Mars is a lander that will burrow deep into the Martian dirt to learn more about the planet's geological evolution. It is on track to launch in 2016. The agency is also planning to launch a new Mars rover in 2020, but it won't have the capability for sample return. Europe and Russia are also planning new Mars missions together, including an orbiter and the ExoMars rover. NASA's announcement on Tuesday means that astronomers are one step closer to understanding what a primitive Mars could have looked like, something that missions in the future will help clarify, Betts added. "I think the findings like today's continue to increase the interest in Mars as a complex and interesting place," Betts said.